Clean chicken by rinsing it inside and out. If it has excess fat, remove it, and pat dry with paper towels. Tuck the wing tips under the body. Season the inside of the chicken well with salt and pepper. Mix rosemary, lime juice, lime zest, butter, and mashed garlic to form a paste. Brush the chicken with the butter-lime mix all over, then season the chicken with salt and pepper. Tie the legs together with a kitchen string. Place chicken in roasting pan. 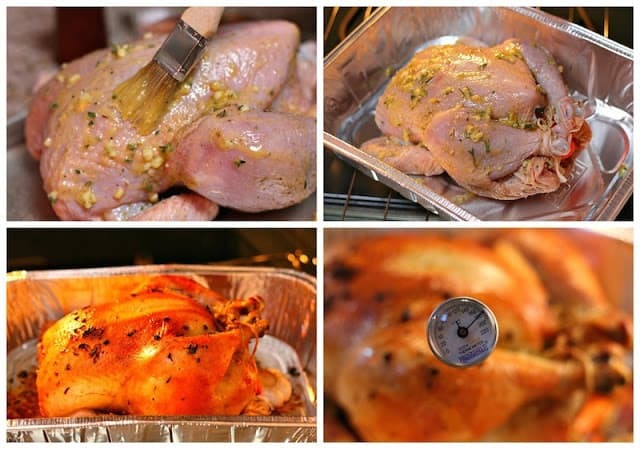 Roast the chicken for 1 ½ hours; you can use a meat thermometer to check for doneness. The breast temperature should read 180 degrees. Mix carrots and potatoes, then season with salt and pepper. Add the olive oil and 2 sprigs of rosemary. After the chicken has been in the oven for 45 minutes, add the potato/carrot mixture to the roasting pan, where they will cook with the chicken juices and flavors. Roast chicken is popular all over the country, and it has a few variations according to the region. Several prefer to add a dried pepper adobo, while others just season it with herbs, like in this recipe. Sometimes, the chicken is even stuffed in the same way a turkey would. Mix rosemary, lime juice, lime zest, butter and mashed garlic to form a paste. Once the chicken is done, remove from oven, and cover with aluminum foil for about 10-15 minutes. Serve with the vegetables. Some people use thyme instead of rosemary, but I personally prefer rosemary because it brings back sweet memories of Christmas Day when my aunts were preparing the dinner and the aroma of rosemary filled the house. I highly recommend you use a meat thermometer when roasting meats. They are not too expensive and will help you to always have tender, juicy roasted meats. The holidays are always a good excuse to gather the family around and enjoy a great memorable meal together. 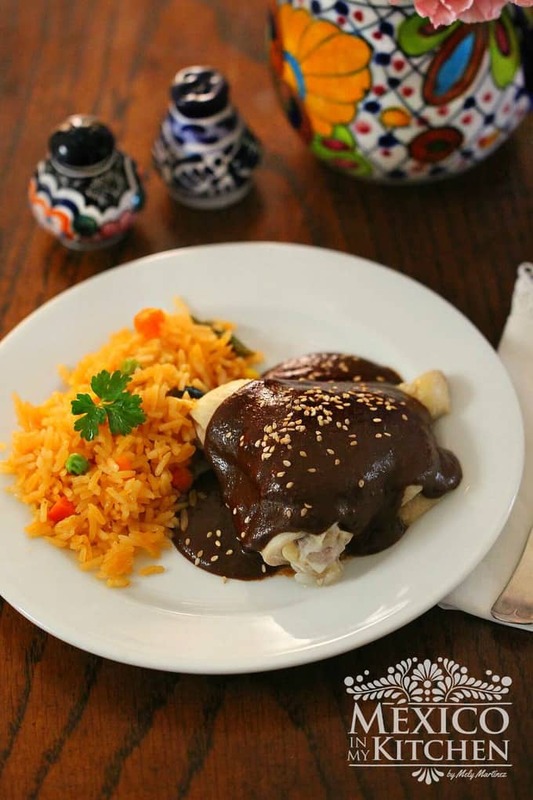 In Mexico, most families prepare a roasted turkey or a roasted pork leg or shoulder. However, some folks prefer a baked chicken, for several reasons, including: chicken might be more affordable, their family may be small, or because they live on a farm and raise their own chickens. Roast chicken is popular all over the country, and it has a few variations according to the region. Several prefer to add a dried pepper adobo, while others just season it with herbs, like in this recipe. Sometimes, the chicken is even stuffed in the same way a turkey would. I am glad that nowadays, with the internet and social media networks available to everyone, people in other countries can get to learn about our Mexican culture, traditions, celebrations, and customs. That way, they can realize that we are also a civilized and vibrant country. Back when I first came to the US, people would ask me all kinds of questions that really puzzled me, like if we used forks to eat, if we only ate tamales for our Christmas dinner, washed our clothes by hand, or if we even had universities in Mexico (by the way, the first university established in North America was founded in Mexico City in 1551). All these questions made me wonder how some people see foreigners, but the time it really hit me was when I went for a job interview for the role of a school teacher and was told that perhaps I was wrong, and meant to be applying for a cleaning position, just because I was Mexican. That was a long time ago, and I hope that nowadays, before judging someone, people will get to know others better and find out more about their country. I also hope that all parents educate their children to be appreciative of other cultures, so that they may become a Judgment Free Generation. 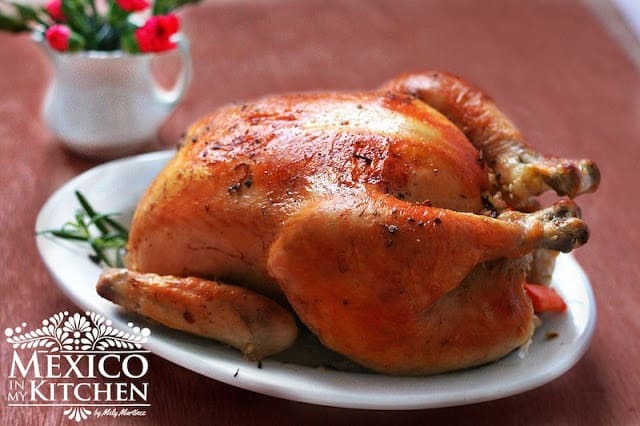 Enjoy the Holiday season, and I hope you try this easy recipe for a delicious Roast Chicken! I’m happy to be a part of this Campaign for a Judgement Free Generation. Looks delicious and I'll be trying it! I think the Judgement Free generation has arrived:) My teen and my toddler don't think in terms of colors because they have interacted with many other cultures and have friends with different cultural backgrounds. My teens friends are the same way, sometimes shaming grandparents for bad comments. This looks delicious. And so simple. The last time I made a baked chicken was when I was married to my ex husband (from El Salvador) and it came out great. I just haven't made another one….don't know why but I will now. My teen son is half black and half Salvadoran and although to me he looks black outwardly, I feel its better that people just come out and ask him questions they may have about him rather than assume. To me curiosity is an innate human trait but ignorance can be corrected. I'm glad I started following you. Mely,This was delicioso! Thank you for sharing, it was so pretty I took a picture of it:) I made it with fresh rosemary, and the potatoes with carrots. The whole house smells wonderful and my family loved it. That is a beautiful bird! It looks just perfect and makes me want a bite right now. As far as multi-cultural, I agree. My wife and I come from very typical American, white bread, Christian, conservative, Republican families. But we raised our kids think for themselves and see people as people. Our oldest child married a person who immigrated from African (Senegal), second oldest is dating a young black woman, and our youngest is dating someone that immigrated from South American. I think that it is so cool, that they can do that without facing a lot of judgement (especially since we live in the South of the US where many people think everyone is racist and a redneck). Wow! Chris, you had done a great job with your kids. Thank you for your kind comment and sharing you family experience. I stumbled on this recipe as a last minute to-do for chicken. This is perhaps the best baked chicken recipe we have ever tried. The seasoning mixture was tremendous, the color of the chicken was wonderful and while I like my meat a little drier and my wife a little more moist, we were both completely satisfied with how this turned out. Also our three year old daughter had such a big portion for a fussy eater. I never write reviews, but the simplicity and flavour of such a wonderful meal warranted a review. Thank you very, very much for sharing :)! Thank you for your kind comment about the Roast Chicken recipe, I really appreciate it.